Students struggling to learn Chinese might not know it, but their task has been made easier because of the work of one man. This makes it easier to learn how to pronounce Chinese words, and is credited with helping raise literacy rates in China. Despite his achievements, Mr Zhou remains largely unknown in his home country. Perhaps that is because the 106-year-old is a defiant character, refusing to take much credit for his work or pander to the Chinese Communist Party. He is critical of the party that governs China - and old enough not to care who is listening to what he has to say. "What are they going to do, come and take me away?" he said in an interview with the BBC in his sparsely furnished Beijing home. Mr Zhou's life has coincided with most of the momentous events of China's recent history, as it has moved from imperial dynasty to peoples' republic to capitalist powerhouse. He was born in 1906 into a wealthy family that managed to lose its money three times: first in the Qing dynasty, then during World War II and finally during the Cultural Revolution, a political campaign launched by Mao Zedong. Nevertheless, he managed to get a good education, studying economics at St John's University, one of the best educational institutions in Shanghai in the 1920s when he was there. Several years of his early life were spent working in the US for a Chinese bank. "It was at No 1 Wall Street - the centre of imperialism," he said, laughing. Mr Zhou laughs a lot, a result of an optimistic outlook. "There are good aspects to even bad things," he said. That does not mean everything in the centenarian's life has gone his way. His daughter died of appendicitis just before her sixth birthday and, like many intellectuals, he was persecuted during the Cultural Revolution. A common form of punishment at the time - in the late 1960s - was to send educated city professionals to the countryside to "learn from the masses". Mr Zhou spent several years working in the fields of Ningxia, a poor region in western China. "It was a waste of time and stopped me doing other things," he said, unable to stop himself laughing again. Despite hardships, Mr Zhou did have one enormous stroke of luck. When the Communist Party took over in China in 1949, he was in the US. He decided to return, along with many others, to build a new country. He initially become an economics professor at Shanghai's Fudan University, but in 1955 was invited to join a committee in Beijing looking at simplifying the Chinese language. At first he resisted, saying he had no professional experience in this field. He was finally persuaded to join the project by a friend. It was a decision that probably saved his life. A few years later, Chairman Mao launched one of his first purges, and many of those caught in the mayhem were those who had gone back to China from abroad. "All university professors who'd returned from the US were labelled 'Rightists'. Many committed suicide, including some good friends. I luckily missed it," he said. It was one of the few moments that Mr Zhou did not laugh. The work he did on the committee not only saved him, it allowed him to make a major contribution to the Chinese language. 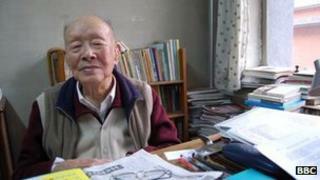 When he started work on developing Pinyin, 85% of Chinese people could not read or write. Now, that is just a few percent. There had been previous attempts to Romanise Chinese characters, but the system developed by Mr Zhou and his colleagues is the one that most people now use, and is recognised internationally. "We spent three years developing pinyin. People made fun of us, joking that it had taken us a long time to deal with just 26 letters," he said. Having lived so long and done such high-profile work, the linguist has met more than his fair share of historical characters. One of his favourite stories is about Puyi, China's last emperor, who became an ordinary citizen under Chairman Mao. Mr Zhou once belonged to a Chinese body that advises the government, work that allowed him to dine at the organisation's canteen in Beijing. During one of the country's periodic food shortages, he ate there daily, taking his wife along too. This meant more food at home for Mr Zhou's relatives. "Everyday when I went to eat, there was an old man sitting next to me. He was also there with his wife," he said. "It was Puyi - the last emperor. Imagine, even the emperor had to eat there because he didn't have enough food." Mr Zhou's age has also given him a long view of history. He believes the Chinese Communist Party will not always rule the country. "China will have to release itself from communism. The future will be dark if it doesn't," said Mr Zhou, who retired at 85, but is still writing books. It is a damning comment from a man who came back to China because he believed the Communist Party when its leaders said they were democratic. Does he ever regret that decision? "We believed Mao's words. We didn't know that when he got into power he would become the worst kind of dictator," said Mr Zhou. "But I don't regret coming back - there's no point," he added, laughing again.